I’ve suffered from carpal tunnel symptoms for years and finally had the surgery on both hands. I hope my experience helps others. 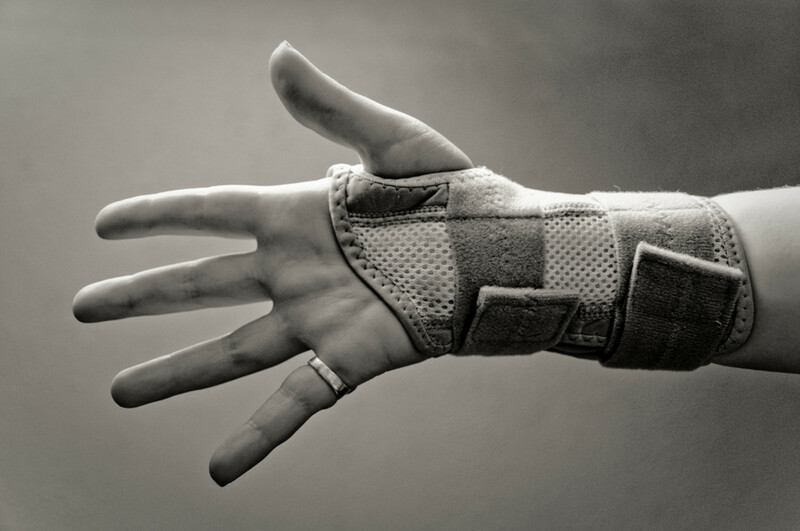 How is the recovery from carpal tunnel surgery? I cannot lie, it’s a bit challenging. But if you know what to expect after carpal tunnel surgery it eliminates surprises during your recovery. I wrote this article because I was looking for information with regards to what I could expect after my own carpal tunnel surgery. 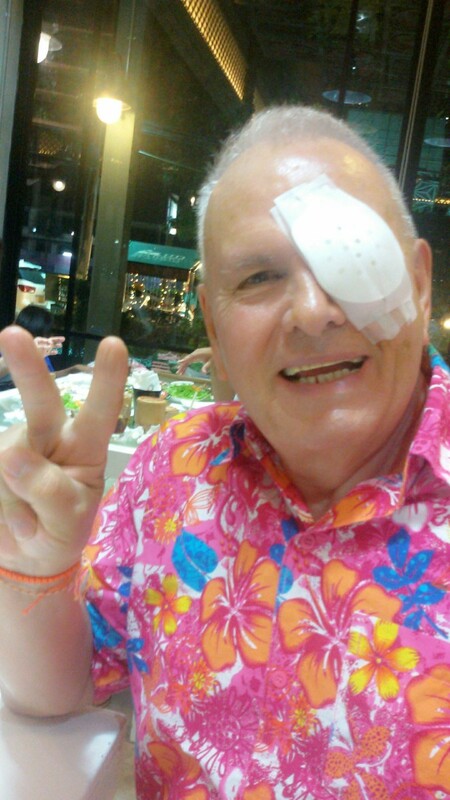 I discovered that there was very little online from patients who’ve been through the surgery. Those were the people I wanted to hear from. There were some scattered forum comments here and there, but little else. I thought an article dedicated to exactly what someone could expect before, during and after this surgery would be helpful to people who may be facing the same surgery, and who may feel scared or worried. I’ve been through the surgery on both hands. Both surgeries were a success. Allowing proper recovery time contributed to that. 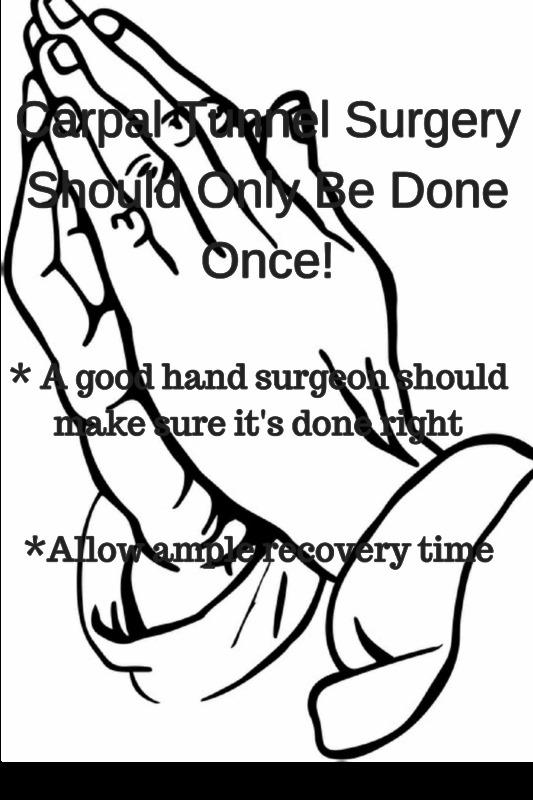 So I’m devoting the rest of this article to providing as much detail as possible as to what to expect before, during and after the surgical procedure for Carpal Tunnel Syndrome. 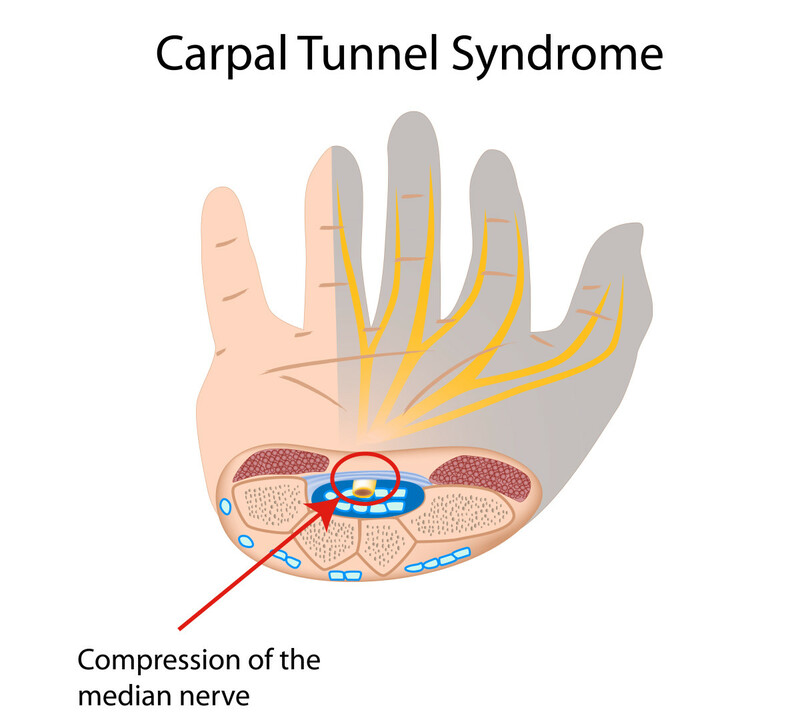 What Is Carpal Tunnel Syndome? In among the bones, tendons, and muscles in your wrist and hand lies the median nerve. This nerve lies within a narrow passageway, called the carpal tunnel, that connects the structures that run between your arm and hand. The nerve has no room to move around because the bones in your hand run through the back of your wrist and hand. Meanwhile, the ligament that protects those bones runs across the front of your hand and presses on the tendons, which in turn, presses on the median nerve situated in the center of your wrist. Over time, the nerve gets inflamed from the constant pressure. The pain from this nerve compression runs from mild to severe. Left untreated, sufferers can start to lose the use of the fingers that are affected. It can only be described as feeling like your hands are asleep all the time. 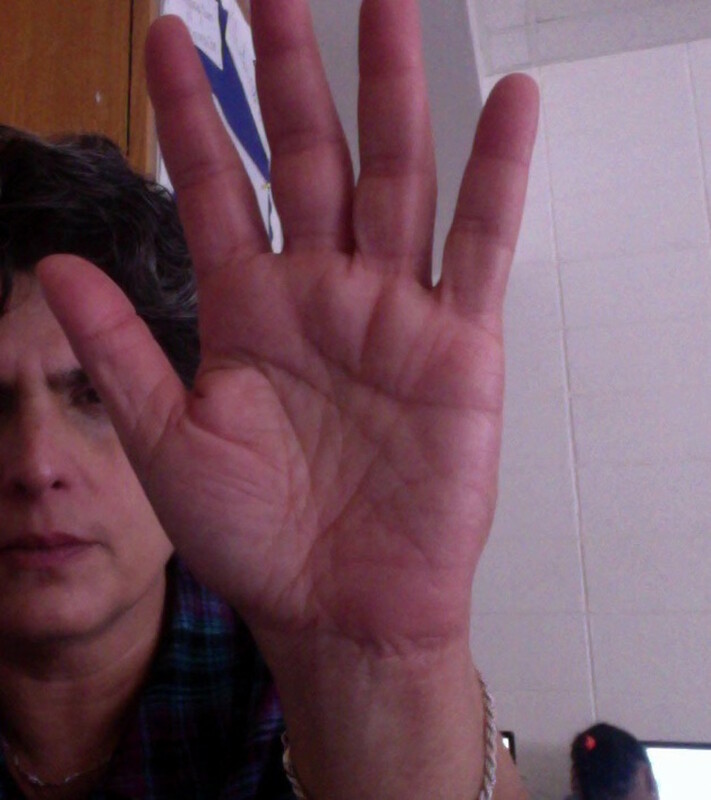 A telltale sign that the median nerve is involved are the fingers that are affected. Carpal tunnel syndrome specifically produces numbness, tingling, and pain in the thumb, forefinger, and middle finger, and sometimes, part of the ring finger. In my case, I didn’t have any symptoms on my ring finger or pinky finger. Some diseases such as rheumatoid arthritis or osteoarthritis can mimic symptoms of Carpal Tunnel Syndrome. Diabetics can also suffer from nerve damage in their hands. This is why it is important to determine the underlying cause with a physician. The true cause of CTS is long-term repetitive motion such as typing, heavy lifting, writing, drawing etc., Any of these activities can contribute to this syndrome. Any work or activity that requires repetitive motions with your hands over the course of months or years places a strain on the median nerve. 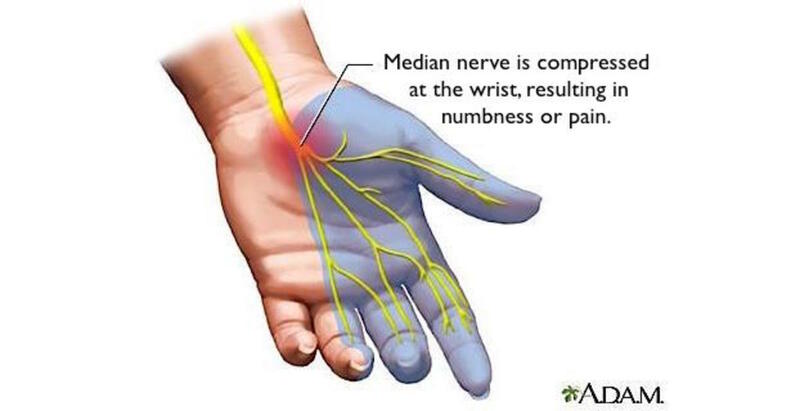 As the Carpal Tunnel Syndrome worsens over time, the pressure on the median nerve becomes almost constant. In the worst cases, the nerve damage becomes permanent. Severe Carpal Tunnel Syndrome is debilitating. There’s no other way to describe it. If you suffer from this awful condition, then you’re used to a compromised quality of life. It’s common for sufferers to struggle with the symptoms for years to avoid surgery. I did. As someone who’s terrified of surgery, I can certainly understand that mindset, I’d managed to maintain my sanity by using the holistic approach to my symptoms for several years. These alternate strategies to manage my symptoms worked for about five years, but in 2015 I watched the symptoms in my right hand steadily worsen. One day, while I was trying to pay for groceries, I realized that taking a credit card out of my wallet was impossible. I was losing the ability to do everyday things that we all take for granted. That was a reality check for me. I knew it was time to consider surgery. Everyone has a bottom when they are dealing with a health condition that affects the quality of their life. The decision to finally have surgery is unique to each individual. I’d been struggling with the symptoms of Carpal Tunnel for at least a decade. Many people suffer for even longer. For some folks, the symptoms are equally bad in both hands. In my case, the symptoms in my right hand were more severe. Unfortunately, the symptoms in my left hand worsened as I relied on it more and more for everyday activities. Eventually, I needed CTS surgery on both hands. I spoke to an orthopedist in 2013 who advised me that, left untreated, Carpal Tunnel Syndrome can cause irreparable nerve damage and muscle wasting. My initial diagnosis was moderate Carpal Tunnel Syndrome. As the symptoms worsened it was upgraded to severe. It was the nighttime symptoms that finally pushed me over the edge. A couple of times a month I would wake up in the middle of the night because it felt like my right forearm and hand were on fire. I would have to get out of bed and shake and massage my hand and arm for at least an hour. By the time I was able to go back to bed it was almost time to get up. Showing up for my teaching job with only three or four hours of sleep was no way to live. I knew that my symptoms were getting worse - and the idea of permanent nerve damage haunted me. 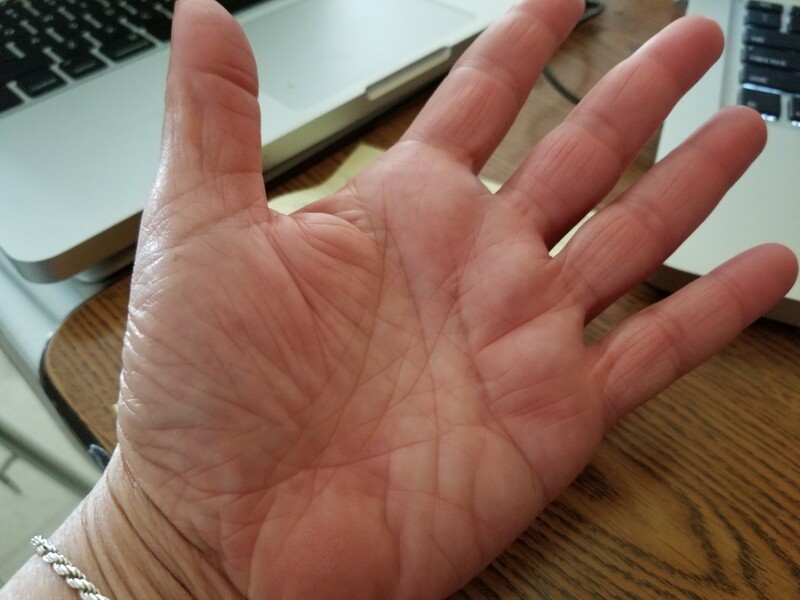 While the measures I had taken such as hand braces and turmeric supplements had delayed the worsening of symptoms for several years, I had to face the fact they were no longer enough. In the spring of 2015, I decided that I couldn’t live with the symptoms any longer and that I needed to take care of it. I have a slight aversion to doctors and hospitals, so I agonized over the decision. But ultimately I had no choice. What kind of doctor treats Carpal Tunnel Syndrome? Some specialties are clear cut. If you have stomach problems, you see a Gastroenterologist. If you’re having trouble with your feet, you go to a Podiatrist, etc. Hand problems can fall into a murky area where they can be treated by an orthopedist who treats injuries to the extremities, or they can also be treated by a hand specialist. After I consulted with the Orthopedic practice in 2013. The doctor I saw told me I only had a 50/50 chance for full recovery if I opted for surgery. I didn’t particularly like those odds. As luck would have it, the orthopedist stopped taking my health insurance, so I had to find a different doctor. I don’t remember exactly how I ended up seeing a hand surgeon, but I was glad I did. He examined my hands, went over my medical records and informed me that I would respond well to surgery. He said some people live with the symptoms for their whole life without surgery, without muscle wasting. Others are not as lucky and the muscles in their hands start to waste away. Once that happens, surgery won’t help. I liked this doctor and his straightforward manner, so I scheduled surgery. The success of the surgery not only depends on the doctor but on the due diligence of the patient and doctor to ask for and administer the proper test. As previously mentioned, there are other conditions such as osteoarthritis that can mimic the symptoms of carpal tunnel syndrome. First, the doctor or physician assistant will do a quick visual exam of your hands. They’re looking for good muscle tone. Then they will do a visual nerve test of one or both hands by asking you to flex your hands forward and backward and then holding the position for a few seconds. This test is called the Phalen maneuver after the doctor who it. These visual exams shouldn’t hurt. Some doctors rely solely on the visual test to diagnosis carpal tunnel syndrome. I think hands are too important for guesswork. I believe a thorough doctor will double check with x-rays or an EMG test - electromyography. Many orthopedists and surgeons will confirm their Carpal Tunnel Syndrome diagnosis with an EMG test. This is electronic stimulation of the muscles in the hand and wrist through the use of small needles inserted into various places around the hand, wrist, and forearm. Then a small electric current is run through the needles to test muscle and nerve function. This test is somewhat unpleasant. The needles feel like mosquito bites. So the pain isn’t horrible, but it's still rather annoying. It takes about 15 minutes to a half hour. I thought the technician who performed my EMG was unnecessarily rough, which was another reason I was glad to switch to another doctor. The test needs to be done once. I made sure I got a copy of the results. 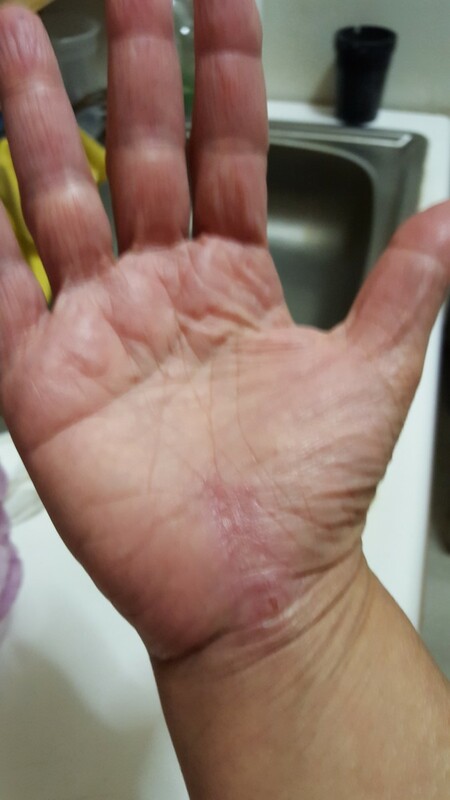 When I decided to wait on surgery for a couple of years, I kept the results from the orthopedist’s office and gave them to the hand surgeon. He carefully reviewed them and was able to give me an accurate prognosis for surgery, without having to redo the test. What Is Carpal Tunnel Surgery? Essentially, Carpal Tunnel Surgery relieves pressure on the main nerve in your wrist. It gives the muscles and tendons extra room to move so they’re not pressing on the nerve. This is done by cutting through the band of fibrous tissue/ligament that cushions and protects the muscles and bones and tendons that run through your wrist into your hand. Cutting open this band of tissue immediately releases the pressure on the Median nerve that causes the numbness and tingling. When the surgeon cuts through the ligament it springs open. The rest of the process happens during the healing phase when the ligament forms scar tissue and closes again making the opening permanently wider. During recovery, the ligament slowly heals under the site of the incision. It’s a major shock to your wrist that takes several months to fully heal. The surgery is a quick outpatient procedure. Many doctors let you pick if you want to be asleep for the procedure. I opted to stay awake for the surgery on my right hand because I didn’t have a ride home. My doctor was agreeable to this - not everyone is, so discuss this directly with the surgeon. The surgeon has to work very quickly because the incision is at the base of your hand where major veins and arteries are located. So they have to stem the blood flow for a few minutes while they’re operating. If you have concerns about general anesthesia, speak to your doctor. Since the procedure is no longer than 15 minutes, you’re not under for very long which minimizes after effects. The procedure is very quick, about 10 minutes, and is done on an outpatient basis. Additionally, the anesthesia they use now is much lighter than what they used twenty or thirty years ago. There’s always a risk, but it is a lot safer. Be sure to alert your doctor if you have any kind of allergic reactions to medications. Right before surgery, they inject the local anesthetic right into your wrist. It is hard to describe how painful this is. Luckily, most patients choose general anesthesia so the injection happens after you’re asleep. The injection of local anesthetic feels a lot like having hot lava injecting into your arm. Those patients who opt for general anesthesia get to miss this part. It’s one of the reasons I opted to be put under for the second hand. I did not want to go through that again. After the injection, they put a tourniquet around your arm to limit the blood flow to your wrist and hand. By the time the tourniquet is tied, the arm is numb. The doctor starts cutting immediately and spends the next ten minutes cutting away at the ligament in your wrist to get the pressure off the nerve. In no time at all, the doctor starts stitching. 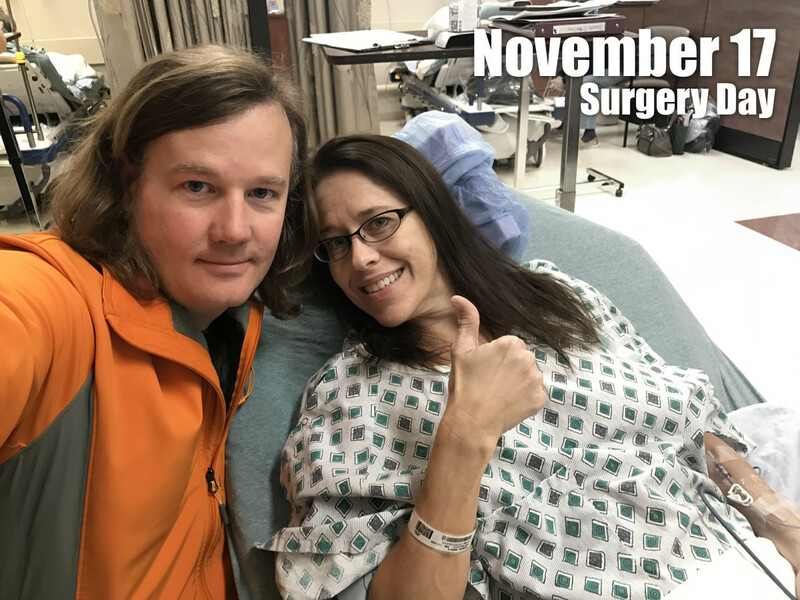 While I couldn’t feel any pain while this was going on, I can say that being awake for this surgery was one of the most unpleasant experiences of my life. You can feel all the cutting and stitching, even though it doesn’t hurt. If you have a low threshold for medical procedures and a weak stomach - I do not recommend staying awake for this surgery. If you have no other choice because of a medical condition or allergies to anesthesia - it does go quickly. It is better than not having it done if you really need the surgery. What compensated for all of the unpleasantness was that when I got up the day after my surgery the CTS symptoms were completely gone. To struggle with such debilitating symptoms for so long and suddenly not have them is life-changing. My surgeon told me it could be a few days before the Carpal Tunnel symptoms completely disappeared. The absence of symptoms the day after surgery was a very welcome surprise. How Long Is Recovery Time From Carpal Tunnel Surgery? If you read any of the medical sites that discuss this surgery, they are very misleading. According to most of the doctor websites I reviewed, they claim full recovery only takes a couple of weeks. 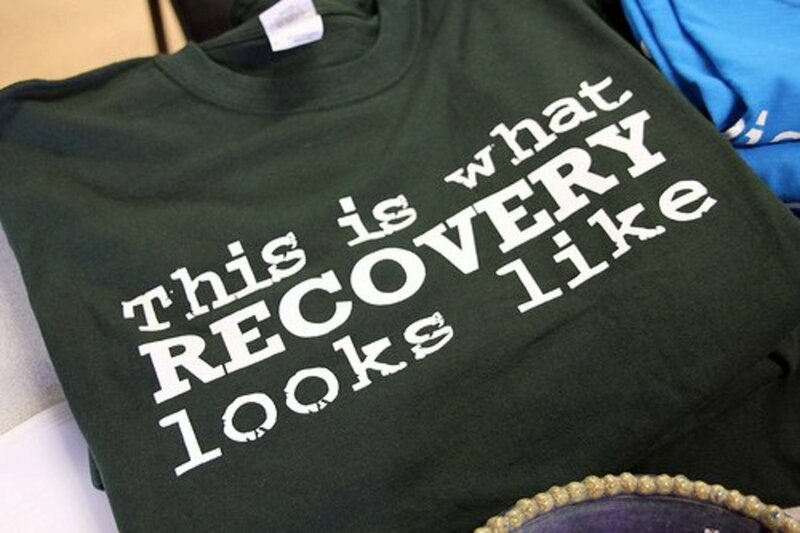 Not true, complete and full recovery takes up to six months if it’s done right. You will need some time off from your daily activities to give your hand time to heal. So picking a time when you can take time off from your job - at least a week or two - gives you the best shot at a full recovery. I am fortunate in that my teaching job gives me summers off, even though I pick up extra summer jobs. I planned ahead of time to put some money aside for the summer, so I didn’t have to pick up extra work. Times vary for each person, some patients are back to work in a week, some within two weeks. To be frank, the people I know who’ve had the best results from the surgery wait four to six weeks before they resume the daily activities that brought on the carpal tunnel in the first place. You Really Can’t Lift or Type for Awhile—Really! If your job requires any kind of repetitive lifting of one pound or more - get a doctor’s note that exempts you from this kind of activity for at least two months. It may sound like overkill, but better safe than sorry. I refrained from touch typing and lifting for at least six weeks for both hands. It might seem excessive to some, but I wanted to make sure that I had a full recovery. This was on the advice of my sister who had the surgery done ten years ago. My sister gave herself two months, and we both made full recoveries that include full use of both hands, no more symptoms of Carpal Tunnel Syndrome, and no scars from the surgery. What Happens if You Don’t Allow Ample Recovery Time? I have a childhood friend that did not give herself enough time to recover. She started using her hand too soon for lifting and typing and had a return of the symptoms. She is now stuck with those symptoms permanently. However, she is a diabetic, so there may be other issues with the nerves in her hands. But she admitted she may not have given her hand a chance to recover probably. For those freaking out and thinking they don’t have six to eight weeks, I am not talking about not using your hands. You will have almost full use of your hand during recovery. You just have to be careful with certain activities - heavy lifting is out. So let someone else lift the groceries, or have everything delivered for a while. 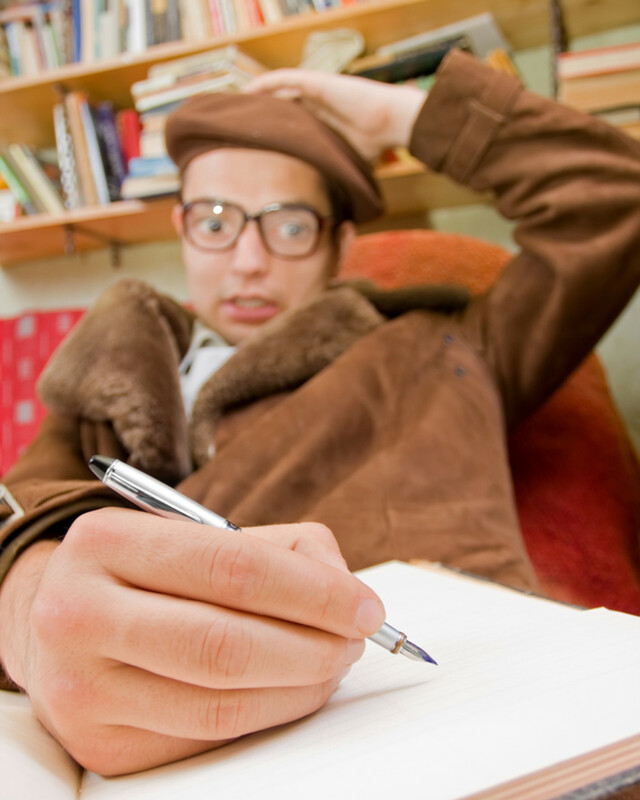 If you do a lot of repetitive typing, then you might want to switch to dictation software. With cloud computing, you can now dictate from any device to Google Drive and other cloud mail services, and save the wear and tear on your hands. I did see some negative comments online while I was researching the surgery. A few patients claim their symptoms came back. These were the same people who only took a week off to recover. Most doctors are hesitant to do this surgery twice. Because if the symptoms persist and you’ve allowed proper recovery, a second surgery may indicate that the ligament wasn’t severed properly the first time. If your symptoms come back - see a different doctor. What Time of Day Is Best to Schedule the Procedure? I always schedule surgery first thing in the morning. I let the staff know that I want the doctor’s first surgical slot. Since carpal tunnel surgery is not emergency surgery, it’s easy to make the appointment far enough in advance to get it over with early in the day. A surgery appointment later in the day means I have to wait that much longer to eat or drink coffee and water. I don't know about you, but I feel out of sorts without that first cup of coffee in the morning. 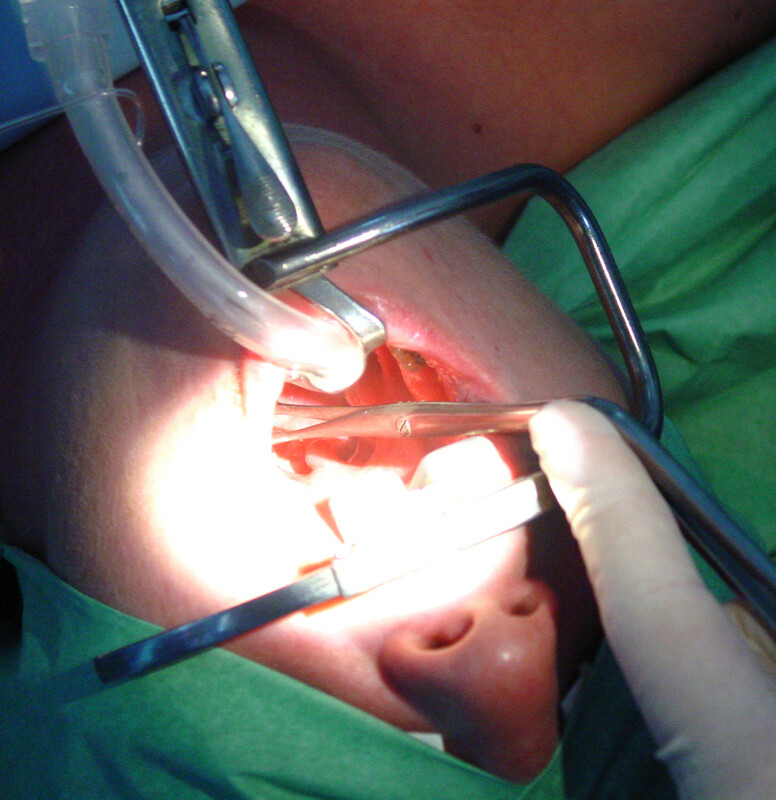 Eating and drinking are prohibited at least eight hours before surgery. An early surgery means I can have a cup of coffee as early in the day as possible. Once the surgery is over and the anesthesia wears off, you can eat and drink whatever you please. Supplements and vitamins are a weird, gray area. Many doctors will not mention them at all since they don’t consider them harmful. However, it is probably a good idea to do without any supplements two weeks prior to surgery, with the exception of a decent multivitamin. I didn’t stop taking my supplements before the first surgery - I take quite a few, including turmeric. I don’t remember exactly how I came upon the side effects of Turmeric, but there are side effects that can be dangerous before surgery. Turmeric is a wonderful anti-inflammatory that has tremendous health benefits, but it is also a blood thinner, which is possibly dangerous before a surgical procedure. I could have had a real problem with bleeding. 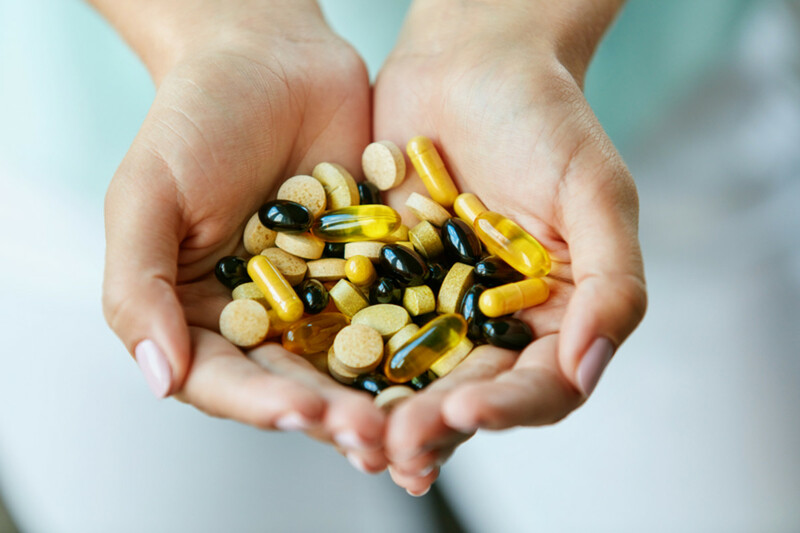 Ask your doctor and do some research if you plan on taking supplements and vitamins up to the day of surgery. My doctor and his staff warned me several times...no pain meds before surgery. This makes good sense considering that any pain medication in your bloodstream can interact negatively with anesthesia. It’s not worth it to take the chance. If you are taking prescription pain medication then speak to your doctor about your pain management meds and needs in the pre-surgery consultation. My doctor prescribed Tylenol with codeine to take after the surgery. Make sure you give them a list of what you are allergic to since some pain medications can cause an allergic reaction. As an interesting side note, I found out when I had some dental surgery that mixing Codeine with the sleeping pill Ambien can kill you. I did not know this, and I happen to take Ambien once or twice a month for insomnia. A bad drug interaction can put you in the hospital, or worse. Make sure you are upfront with medical personnel about all drugs you take. Most hospitals and surgical outpatient centers require a hands-on physical exam by your primary physician to clear you for surgery. This will usually include an EKG to check your heart, blood pressure check, blood test and they will listen to your lungs. This exam must happen within 30 days of your surgery. The exception is taking blood pressure or diabetes medication with a few sips of water as soon as you wake up. Double check with your doctor. Make sure your ride is available to pick you up at a designated time. Usually an hour or two after the carpal tunnel surgery. Most medical facilities will not release you after general anesthesia unless you have family or friend to pick you up and take you home. We take our hands for granted. I didn’t give a lot of thought to my limitations after hand surgery because I don’t like to stress myself out. I’m one of those people who just deal with it when it happens. However, I did give some thought to the clothing issue because there were some challenges. Try to wear slip-on shoes because it may be a few days before you can tie shoelaces. I also bought a pair of sneakers with velcro straps to make life easier. Reebok is one of the brands that offer a really, sturdy, comfortable sneaker with velcro straps instead of laces. I kept the pair I bought for my surgery, and still wear them years later because they are so comfortable and lightweight. Try to wear clothes that slip on and off. Unless you can zip or button with one hand, wear the sweatpants and t-shirt. Ladies, do not bother with a bra, you will not be able to hook it or unhook it by yourself. Even trying to get a stretchy sports bra over your head will be difficult. You’ll be glad you just went without. If you must wear a bra, you will need someone to help you get it on and off after your surgery. Prepare for the fact that you may not be able to get a bra on or off for at least a few days. 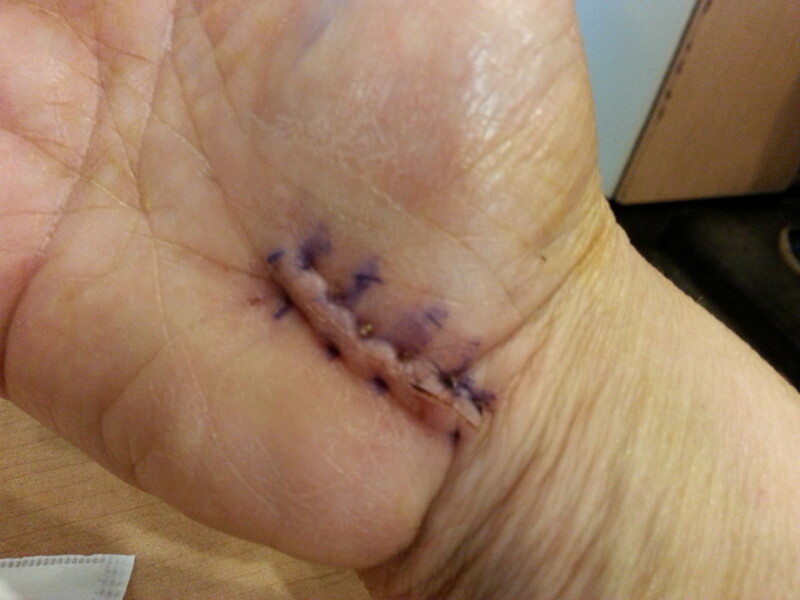 Carpal tunnel surgery is a short procedure, about 10-15 minutes. That means you will not be under anesthesia for very long so the after effects will not be too bad. You may wake up feeling a little groggy, but it won’t take more than a half hour to feel tired but fairly normal. My take on general anesthesia during these procedures is that it feels very similar to a slight hangover. I usually go home and take a nap and eat a decent meal and I feel normal within a couple of hours. The staff will offer you juice, crackers, and cookies because you will be very hungry and thirsty. Once you feel ok, they will let you get dressed. This is where you will be very happy that you picked clothes and shoes that are easy to get on. You will have one hand encased in a giant ace bandage. So normal everyday activities are going to feel awkward for a while. I tried all kinds of ways to get around this because I didn’t want to believe it. I need my showers every day. I went and bought a decent shower sleeve on Amazon. It worked well for a few days, but on the last day before my follow-up appointment to have the giant bandage removed—disaster. Some water leaked into the sleeve because I wasn’t careful. The sleeve itself was quite watertight. But I wasn’t paying attention and the bandage got soaked. I ended up taking it off the bandage myself - which is not a good idea. It wasn’t a good situation and I wouldn’t risk it again. The bandages will usually need to stay on until your follow-up appointment with your surgeon, usually 5-7 days. The bandage needs to be kept clean and dry to let the wound close up. Even though the wound is stitched closed, it needs to heal enough for the stitches to come out. The surgeon covers it to give it the best chance to heal as quickly as possible. Tampering with the bandage or getting it wet can compromise wound recovery. I started stretching and flexing my fingers as much as possible right after the surgery. I continued doing this every day for my entire recovery. As soon as the pain subsided enough and the bandages came off I also practiced making a fist as much as possible. Everyone’s hands are different, but if you can tolerate gently stretching and flexing as much as you can it will pay off in a quicker recovery time. After the first month of recovery. I used one of those squeezy balls people use to relieve stress. Those balls are very useful for improving muscle strength in your hand. 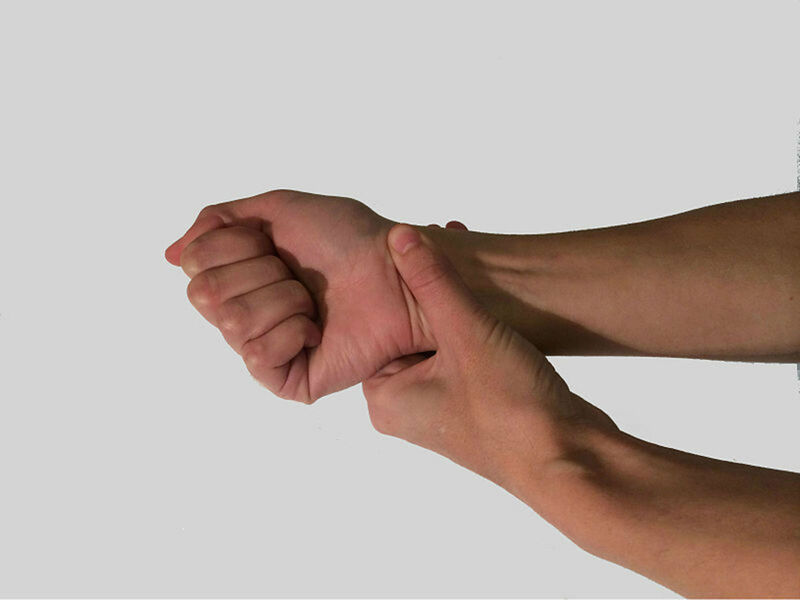 I had used the hand squeeze stretch balls while I was dealing with the symptoms of CTS. I’m glad I saved the set I bought because they were incredibly useful during my recovery from the surgery. I’m sure they contributed to regaining full use of my hands. If exercising your hand hurts too much then stop and wait until you see your doctor. Exercising should not cause any serious pain. if it does then your body is telling you no. You can always consult with a physical therapist when your doctor says it’s safe. My surgeon was very impressed with my progress at the follow-up appointments. He said I didn’t need any physical therapy. I’m convinced that exercising my fingers on my own after both Carpal Tunnel Syndrome surgeries speeded things up. I recommend the adult wipes as a substitute for a showering for a few days. Any brand from the drugstore will do. I used them for my second surgery and the bandages stayed in good condition until they were removed. Your doctor may not specifically tell you not to shower. But they stress keeping the bandage clean and dry. You will also not be able to wash the bandaged hand for a few days, but you can carefully apply hand sanitizer to the exposed fingers. That's what I did. I was uncomfortable not being able to wash my hands, but when you have no choice you manage. During my recovery I discovered the pain levels varied. I don’t think it ever got worse than 6 on a scale of 1-10. Everyone has different pain tolerance. 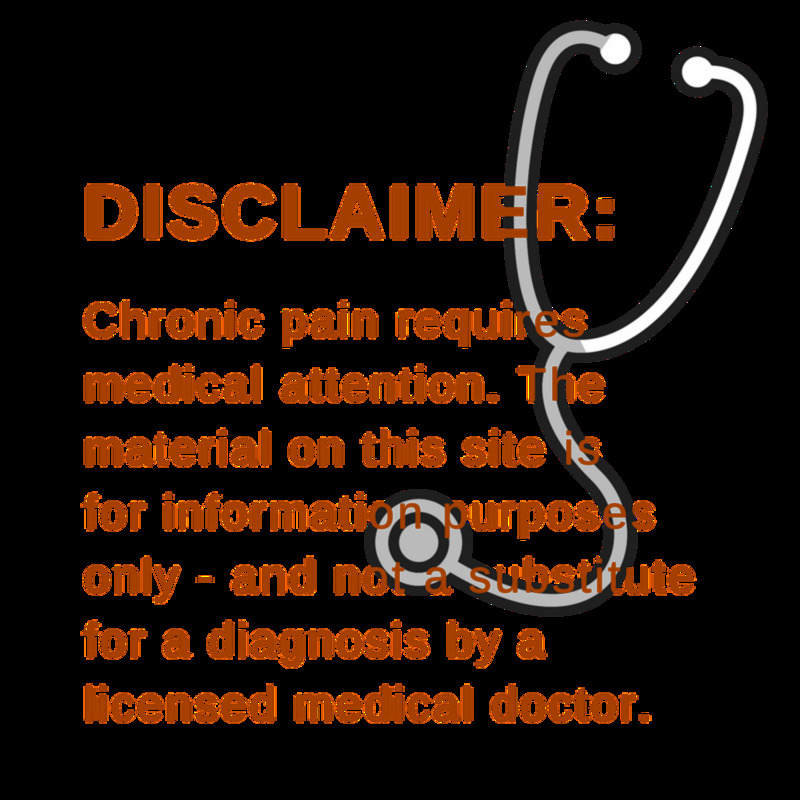 The pain was noticeable all the time for the first three months, but it was never debilitating. After the first three months, the pain would come in spurts. It didn’t hurt every day. But when it did act up, it was noticeable. They gave me Tylenol with codeine which I took for about three or four days and then stopped. They will check with you to find what you are allergic to and then they will prescribe what is safe for you. I don’t like prescription medications because they make me sleepy all the time. For the first few days after surgery it’s important to get extra rest, so being out of it and sleeping a lot was fine. I took what was prescribed. Once a few days had passed and I needed to get things done I took over the counter Motrin as needed. I never took more than one dose a day. I never needed it more than once or twice a week for the first three or four months after surgery. As you can see from the pictures I have no scars from the surgery. I don’t know if I’m unique, but I do know they try to minimize scarring with this procedure. My doctor advised me to massage the wound as much as possible to reduce scarring. I took it to heart and made sure to massage the wound several times a day until healed completely. I don’t know if that’s the reason I have no scarring. I am one of those people who heals quickly, but I know it can’t hurt. Plus, it feels good since that part of your hand is stiff and tight for a few months. Once the bandages come off you will be very relieved. But you will now have to take care of the wound and make sure the base of your hand doesn’t hit any hard surfaces. I banged my hand once and the pain was off the charts. I made sure it didn’t happen again. You want to minimize scarring and any chance of infection, so after care of the wound is very important. My doctor used dissolving sutures so I didn’t have to have the stitches pulled out. However, I was meticulous with cleaning the wound several times a day. I doused the wound at least twice a day with hydrogen peroxide. They recommended wearing a bandaid, but I can’t seem to keep a bandaid on my hand for more than a few minutes. They fall off. So I went without and it was fine. However, I was extra careful about not lifting anything with that hand and not banging it into anything. 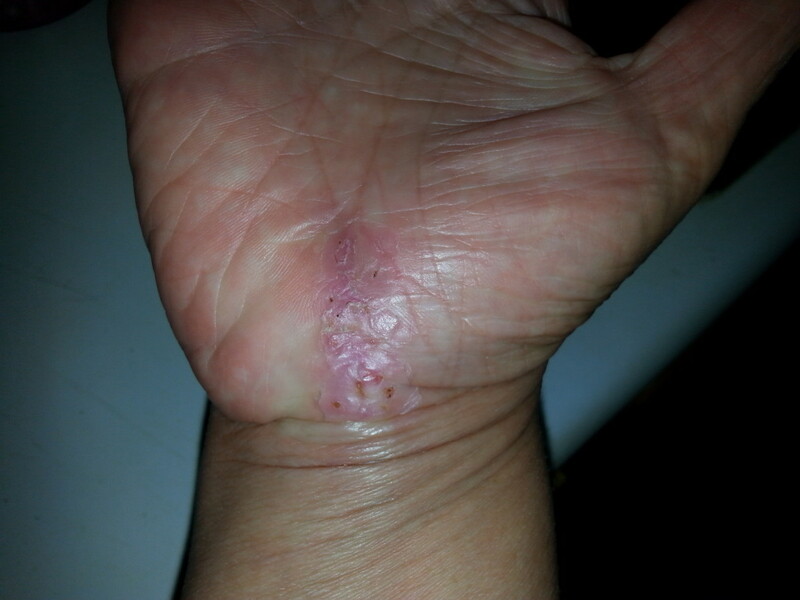 I sprayed hydrogen peroxide on the wound and applied Neosporin a few times a day to minimize any chance of infection. I wasn’t aware that as the wound heals, the skin starts to peel a bit. It is very tempting to play with it and pull it off, especially if you have some slight OCD like me. I did it once. I pulled off too much skin which hurt. I learned quickly to abstain from pulling off any skin. Since the peeling skin was driving me crazy. I finally figured out how to use a new, unused emory board to file down the skin so I wasn’t tempted to pull it off. I don’t know if that’s medically approved, but that’s what I did. As soon as I gently filed off the excess skin, I applied more hydrogen peroxide and Neosporin. Our hands touch everything in the course of a day. That’s why any kind of wound to the hand requires meticulous and frequent washing. The downside is that all the washing causes dry skin. I have researched skin creams and I have found that the best ones contain arnica. Arnica comes from a plant that’s in the dandelion/sunflower family. People have made creams and salves from this plant species for hundreds of years. Since I am an Amazon junkie, I researched the customer reviews on several skin creams and bought the Boiron Arnicare skin cream. I made the right choice because it didn't smell, wasn't sticky or greasy and eased the pain. I still use it for arthritis in my knees which acts up all the time. My methods may not be scientific, but I usually get good results. It's really about individual choice, but the arnica gel worked wonders on my surgical wound. I made sure I didn't lift anything heavy for 6-8 weeks. My hand would squawk at me anytime I overused it. So I would stop whatever I was doing. Even vacuuming would cause a pain flare-up sometimes, and then sometimes it was fine. Pain is a helpful took during recovery. If anything causes a spike in pain - stop. As I mentioned previously, I stretched and curled my fingers as much as possible during my whole recovery. Once I passed the six-week mark, I also started a regimen of exercising the muscles by squeezing the soft hand grip balls. I used to use the squeeze balls when the carpal tunnel was moderate, to offset the symptoms. These soft squeeze balls are not always easy to find in the store, so I went to Amazon and found a set with excellent ratings at a great price. I love them and still use them to maintain strength and muscle tone in my hands. I even keep a couple at work to use as stress relief. When my job really starts to get to me I whip them out and start squeezing. No one even notices. Only you can decide when you can return to your job. Most hand surgeons prefer you wait two weeks, which usually around the time the stitches fall out. If you have a job where you have some control over what you do. In other words, if you can work without lifting anything heavy, or excessive keyboarding, then returning to work after one week should be fine, even if the stitches are still in - just keep them covered and clean. You may have to allow a little extra time in the morning to get dressed because pulling on pants and shirts is going to hurt a little, if it’s not done slowly. 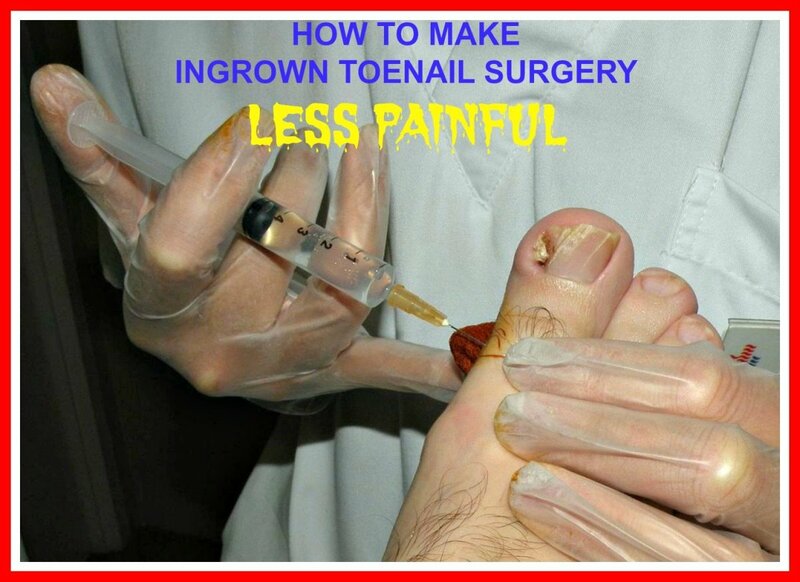 The surgery is quick and you have use of your hands almost immediately. Just take it easy and don't overuse them. The pain from the surgery will slowly dissipate. It can take months for the pain to fully subside, but the benefits of this surgery, mainly, having full use of your hands again, are well worth some pain.